All kids love candy but I think we can all agree that there’s no shortage of it on Halloween after a night of trick or treating. My oldest son has a long list of allergies so most of the candy the kids get on Halloween makes a quick exit from our house to keep him safe. Even for the kids without allergies, getting something a bit different is exciting. 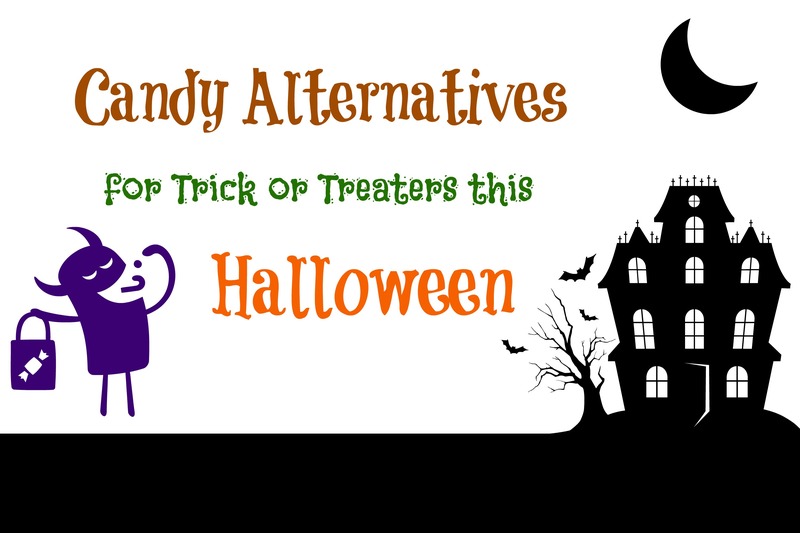 No, I’m not talking about going the “It’s the Great Pumpkin Charlie Brown” route and handing out rocks, but there are lots of alternatives to candy that don’t have to break the bank. Hit up the dollar store or party aisles of your favorite store to buy things like bouncy balls, Play-Doh, stickers or tattoos. These are all fairly inexpensive options to pick up for the little ghosts and goblins coming to your house in a couple of weeks. Another fun option that kids could use the same night are glow sticks. You could already have them glowing and put together as bracelets for the kids if you have an idea of how many trick or treaters to expect. Candy free doesn’t have to mean food free. There are lots of allergy friendly options in the prepackaged snack world. Consider goldfish, pretzels, puff corn, fruit pouches like GoGo Squeez or granola/grain bars. A mix of several options is a good bet based on kid’s preferences and allergy issues. Even things like juice boxes or water bottles are a fun surprise. No not from the Sunday paper… Chains like Wendy’s sell coupon books for a different items at their restaurants with a portion of the proceeds sometimes going to a charity (double bonus!). Be sure to pick them up soon – locally they’ve run out before Halloween. While it might sound silly (and a little Charlie Brown) there’s nothing wrong with handing out an apple, orange or banana. I would stick with something that has some kind of skin that can be peeled or washed. …not all of these ideas will work for everyone and I get that. Kids with allergies, or even little trick or treaters who can’t eat candy yet, can choose from a special basket if you’re aware of their need. …for neighborhoods with a lot of trick or treaters some of these ideas could get pricey. Consider doing something special for the kids on your street, your kid’s classmates or family members trick or treating. …all that candy looks delicious. Be sure an adult checks all the goodies before the kids dig in. I know some parents might shy away from letting their kids eat something from a stranger. We never trick or treat where we don’t know the people so this isn’t a problem for us. What things besides candy do you like to hand out for Halloween? Remember to decorate with a teal pumpkin if you have allergy friendly treats!